I'm entering my Orange Iced Plum Cupcakes in Sugar High Friday's Sweet Asian Invasion April event hosted by Amrita of La Petite Boulangette . Let's face it Asian Cuisine is not something I do very often so I have limited experience and anything beyond Sesame Seed Oil and Wonton Skins is foreign territory. My husband suggested that we go to Nitakaya USA, which is a huge Asian market sort of like an Asian Walmart only much better and there's a wonderful food court! It was great fun wondering around the aisles and not recognizing a darn thing! We spent at least two hours just meandering and if my husband said it once he said it a dozen times "What is this?". Like I'm supposed to know??? I wanted to buy so many things, the colors and packaging were fantastic, but finally decided on two bottles of Plum Wine, Black Sesame Seeds and a bag of Sweet Red Bean Paste. Very boring things but I was comfortable that I could make something not only beautiful but tasty too! When we got home, I set my goodies on my kitchen island and thought about what I was going to make. But first I wanted to taste the Plum Wines! Frequently I reduce juices and use them to flavor my frostings and onw of the Plum Wines had a wonderful fruity taste and I knew it would work well in frosting. So my decisions were over and I knew I was going to make cupcakes. Cream the butter, mascarpone and sugar in the bowl of an electric mixer fitted with the paddle attachment until light and fluffy. Add the eggs, 1 at a time. Mix in the chocolate syrup, ganache and vanilla. Add the flour and mix until just combined. Don't overbeat, or the cupcakes will be tough. Scoop the batter into the muffin cups and bake for 30 minutes, or until just set in the middle. Don't overbake! Remove the cupcakes from the cupcake pan as soon as possible. Heat the cream in the microwave. Pour cream over chocolate chips and add vanilla. Stir until chocolate is totally melted and ganache is smooth. Over medium heat in a heavy-bottomed sauce pan reduce 1 c. of Plum Wine to about 2 TBL. The wine reduces very quickly so do not leave your kitchen! When the wine is significantly reduced cool to room temperature. Cream together cream cheese and butter. Add 1 tsp of the reduced Plum Wine and blend well. Gradually add 2 c. of powdered sugar. When the frosting is completely mixed taste it and if you think you need more Plum flavoring add a drop of reduced wine at a time, mix and taste until you are happy. Peel the orange, careful to not slice into the pith. Put the thin slices of orange peel in your food processor and add the sugar. Process until the orange peel is very finely ground but you can still see tiny pieces of orange. The sugar will be damp and you will need to let it dry out before you can sprinkle it on the frosting. I just spread the orange sugar on a cutting board and after an hour or so I transfer it to the bowl. Once in the bowl I stir it with a fork and break up any sugar clumps. Just keep repeating stirring with a fork and breaking up any clumps until the orange sugar is dry. The sugar will preserve the orange and there will be no color lost and it will keep forever in a tupperware like container. However it will fade if exposed to light, so keep it in a kitchen cabinet towards the back. You can also use any citrus fruit peel, lemon, grapefruit, etc., and use the same method. To assemble: Pipe frosting on the top of each cupcake. 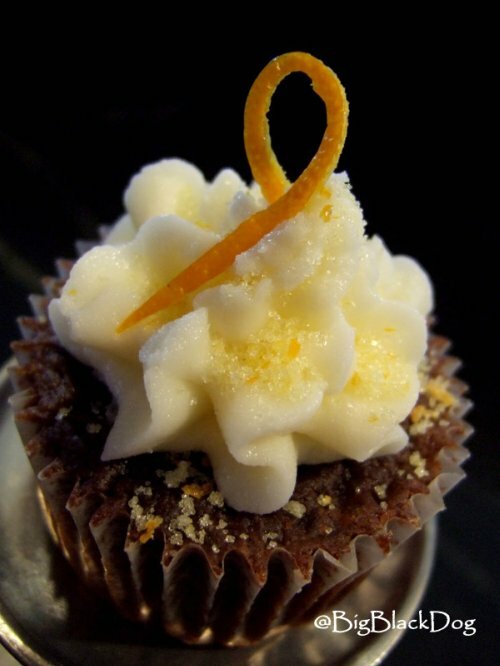 Sprinkle with orange sugar and top with a orange curl. Your cupcakes look amazing! And... of course I love your "Feathered Plum Frosting" sounds absolutely divine and a must try! beautiful! It is such an interesting combination...I'll have to give it a try! OMG that is awesome ! Gosh...thanks guys! I so appreciate the compliments!! 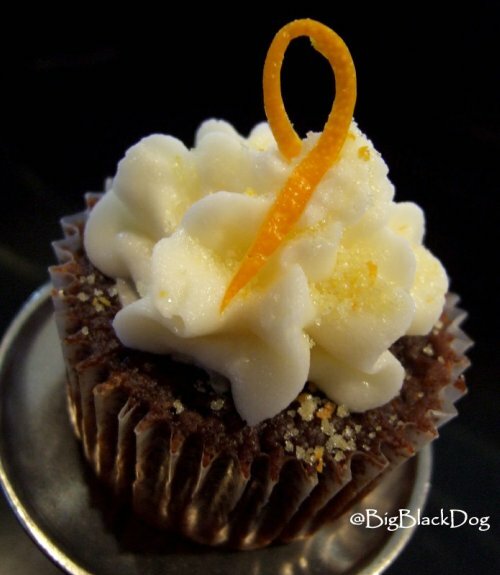 The Orange Iced Cupcakes were a blast to make...just so much fun. This is the first time I've tried reducing wine for my feathered frostings, but it won't be the last. Beautiful decorations! Looking forward to your Tried, Tested and True submission! And I love the header picture for your blog. I would die for a range like that. Gorgeous! And fabulous flavors going on here. LOVE!